Why does TriDuo use two photographers for your wedding? Will they both be shooting the same picture? Can't one photographer capture all the memories from your wedding? 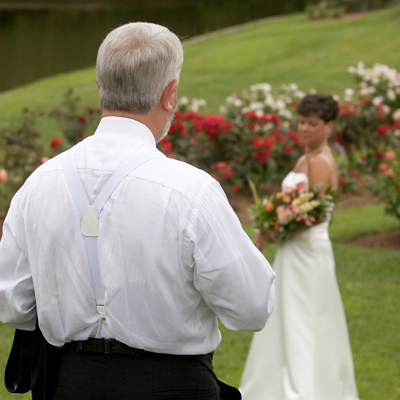 Don't other wedding photographers charge extra for a second photographer? 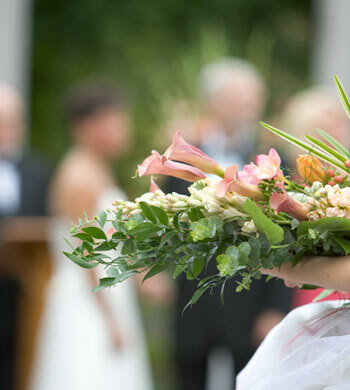 We have found that many of your wedding's magic moments are happening all around you and, more often than not, the bride and groom miss these special moments. Our wedding clients have been thrilled by the candid moments captured by our second photographer. One photographer focuses on the bride and groom and the other focuses on all the wonderful moments surrounding the bride and groom. Here the proud groom admires his bride while she poses for a formal picture. This image, captured by our second photographer, is priceless. As our first photographer captured moments at the altar, this image of the flower girl was captured by our other photographer. Two photographers provide the unique opportunity to capture your wedding moments from several perspectives simultaneously. We can unfold a story that you missed in all of the excitement. The combination of formal shots and candids will provide the new family with an unparalleled window to their special day and a lifetime of lasting images. There is no extra charge for this service. Our quoted fee provides you this extra level of coverage. Your wedding is a very special event and TriDuo feels very strongly about capturing moments that would otherwise be lost without the second photographer. You will appreciate your moments from different perspectives!